StorageGRID Webscale 11 now supports native integration into the AWS cloud. This includes cross-region replication to AWS S3 using CloudMirror, triggering of notifications to Simple Notification Service (via SNS), as well as metadata streaming into Elasticsearch for search capability. With Amazon’s Simple Storage Service (S3) being “the internet’s hard drive”, many younger companies already rely on S3 to store massive data sets. In contrast, long-standing companies have large data sets stored in traditional on-premises infrastructure. These customers are looking at ways to drive new value from their existing data and to operate with greater efficiency. Moving their data to the cloud seems to be the obvious answer. This usually means thinking about how to bridge from on-premises to the public cloud to build powerful data processing pipelines. For taking advantage of the upsides of both options, we introduced native integration with Amazon Web Services (AWS) in StorageGRID Webscale 11.0. 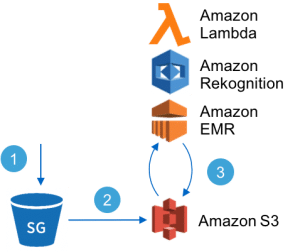 StorageGRID is now able to replicate data into AWS S3, trigger the AWS Simple Notification Service (SNS), as well as stream metadata into ElasticSearch for indexing. This allows for easy consumption of AWS data for building powerful data processing pipelines. Customers can choose which data to replicate to the cloud with precision or even trigger AWS functions to run against data stored on premises. This creates cost advantages by giving customers the flexibility to store colder, PB scale data sets on premises to control costs, with the flexibility to take full advantage of the ever-increasing features of a public cloud. In the remainder of this post, we’ll show how to configure CloudMirror replication into StorageGRID and explain how it works. CloudMirror replication allows replicating objects from one source S3 bucket to a destination S3 bucket. The replication runs asynchronously in near-realtime and is independent of the geographical location of the buckets. Furthermore, an arbitrary combination of versioned and non-versioned buckets can be used. As an example, the source could be non-versioned, but the destination versioned. With StorageGRID 11.0, you can replicate on-premises data to one or more AWS regions. You can use this to create an additional copy of your data for superior protection. More importantly, this enables using Amazon’s analytics or machine learning services to derive new insights from your data. Let’s look into this with some more details! Trigger EMR, Rekognition, Lambda or feed data into Kineses, machine learning, etc. Secondary disaster copy off-site – Replicating objects from an on-premises StorageGRID to AWS S3 allows us to potentially rely on a more cost-efficient data protection scheme. This is because we now have an additional disaster copy in Amazon. Furthermore, we could also replicate data to endpoints other than AWS, such as a secondary, stand-alone StorageGRID. The secondary could be another S3 endpoint operated by a service provider or a StorageGRID instance run by a different entity within the same organization. Obviously, there are more use cases possible, only limited by what you can do with the AWS and your imagination! Next, let’s look at how to configure it. As a next step, we need to login to the StorageGRID tenant UI and configure our new S3 bucket as a replication endpoint. To do this, navigate to S3 –> Endpoints –> Create and fill out the fields with the URI of the AWS S3 region endpoint address, the URN in the format arn:aws:s3:::<bucket_name> and your access and secret access keys. The AWS S3 region endpoint URLs can be found in the AWS documentation. One thing which is noteworthy here is that replication took around one second in this example, but larger objects might take longer to replicate. StorageGRID WebScale 11.0 introduced tight integration with AWS. StorageGRID is now able to replicate data into AWS S3, trigger AWS SNS, and stream object metadata into Elasticsearch. Therefore, you can now easily build hybrid-cloud workflows. As a result, you can gain new insights from your data that sits in your on-premises data center. In this post we’ve showed how to configure CloudMirror replication between StorageGRID and AWS S3, a solid foundation for building powerful data pipelines! If you want to learn more about StorageGRID WebScale, check out our other posts or join us on the Slack team.